12.34 p.m. R1 11 Crossed My Mind (4 m Zed – The Lions Rule, by Viking Ruler) – Jake Bayliss; resumed with a solid sixth in the Maiden 3YO 1200 metres on 21 July at Te Rapa, and done well since getting back and running home well for fourth in the Maiden 1400 metres on 11 August at Pukekohe. Stepping to a mile appears ideal and she looks a top five chance from barrier five in this field. Fixed odds: $9.50 & $3.10. 2.19 p.m. R4 7 Ivette (5 m Jimmy Choux – No Reins, Show A Heart) – Jake Bayliss; resumed with a game run against the rail here in the Maiden 1200 metres on 25 July and steps in distance for the $10,000 Maiden 1400 metres. Barrier eight seems suitable and she rates an each way chance if able to frank her first up run. Fixed odds: $8.00 & $2.80. 3.29 p.m. R6 7 Fly to the Moon (4 m Reliable Man – Fly Silca Fly, by Hawk Wing) – Jake Bayliss; capped good form when striding clear to win the Maiden 1600 metres here on 25 July at Matamata, before finishing seventh in the worst going on the inside in the Rating 65 1600 metres on 11 August at Pukekohe. 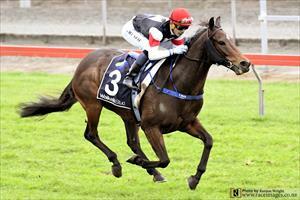 Back on her home track in the $10,000 Rating 65 1600 metres, she can return to form as an each way chance. Fixed odds: $6.80 & $2.30. 4.04 p.m. R7 4 Ali Baba (6 g Savabeel – Dreamworks, by Maroof) – Jake Bayliss; trotted in by 4 ¼ lengths when winning the Rating 70 2000 metres here on July 25 and faces a similar field in the $11,000 Rating 72 2000 metres. Barrier one is an obstacle if outside running provides the best footing, but given the right ride he should prove very competitive. He is aiming to record his fourth win from seven starts on the home course. Fixed odds: $2.40 & $1.20. 4.38 p.m. R8 12 Akaba (5 m Holy Roman Emperor – Aphelie, by Street Sense) – Jake Bayliss; has been given time (46 days) since resuming with a good effort for sixth in the Special Conditions Maiden 1600 metres on 14 July at Ruakaka. Improved for the outing and given plenty of work in the interim, she contests the $10,000 Maiden 2000 metres. Twice third placed, over 2300m & 2400m in France, she is expected to cope with the footing and should go well. Fixed odds: $9.00 & $3.00.